I might be overdoing my fetish with weather a little much but if you have gone through 4 months of winter cooped up inside the house you will understand me. It’s a sunny morning with chirping birds, asphalt glistening after being washed in yesterday’s rain. Everything looks watered, cleaned, afresh and I am going out today. Ooooh! Love it! My going out and having a little walk may also be a little more of a necessity than just smelling the flowers and watching the blue, blue sky. The rich mughlai food I have been indulging in. After gorging on Malai Kofta here is dal makhani for you, a splendid dish with rotis. It tastes good with rice or pulav but I love it best with plain rotis. No butter. No oil. I am talking about the roti. However, the dal makhani (translated as is, lentil in butter) as the name suggests is loaded with fat. Creamy with taste of beans, peas and lentils the dish is a must try. 11. Garnish with coriander leaves and a scoop of butter and serve it hot with rotis or rice. Its has been a long i prepared dal makhani, such a protein packed and nutritious dish to enjoy along with rotis.. The Rajma grains are screaming.. eat me!.. looks delicious..
Rajma looks delicious and so healthy..
Creamy and delicious. All you need is some garlic naan to go with this. YUM!! This looks delicious! its one of my faves when its cold out side! I'll be honest, I have never even tried dal makhani (as in not even tasted it), I always managed to give this item the slip when faced with it in an indian restaurant. The preparation looks simple, and your pic looks dreamy. Must try. must bookmark. Spring is here too, it seemed to happen overnight, the neighbors trees are covered in little flower buds and new leaves. Looks delicious and creamy. Nice marco shot too. Every thing is very perfect. first of all.....fantastic foto and a yummy recipe!i loed the pic soooooooooooooooo much, who is the photographer? ?...This was one thing i wanted to try long back, but forgot about it as blogging took its way!thanks alot for reminding.will come here to chk out. another of my fav! loved ur preparation..
Lovely and delicious.Rich and creamy. That's a filling and delicious bean dish! Sounds wonderful, healthy and warming! Perfect with roti! I really wish I lived near you so I could invite myself over (sweetly) for dinner!!!! My friend made dal makhani once and she tried to tell me the recipe but some of the spices were unheard of. I need to check online for this recipe. I m a big fan of this dal n make it often with whole urad n rajma. Roti and the dal makhani looks like a divine combo! I enjoyed reading ur comments on my blog. First time here on ur blog, u have neat space....and i love Dal Makhani. Its looks so good and delicious! I bought some chick peas last week to cook dhall curry. Thks for publishing this recipe! Hahaha, you like to go out, but I like to stay at home as the weather here is super hot. This dish looks good. The dal makhani looks yum...ready to be devoured,indian food gives such a high! Looks perfect and delicious, its been long time i didnt tried the dal makhani for roti. Sure will try this soon. A marvellous & tasty dish!! so simple yet so delish...great pics as usual, my friends! you're absolutely right about appreciating the chirping of birds and the weather!!! I feel the same too, I think I'll start writing a poem about the blue sky, the birds & flowers... lol had enough of this winter!! waiting eagerly for the spring to settle!!! Dhal makani looks delectable with the rotis; I like to have it with pulav too!!! hope you had a nice breezy refreshing and sunny outing day !!! A perfect treat to welcome spring. Dal Makhni looks perfect. I am so excited for spring also...I can feel it on the horizon. This dish looks so delicious. The perfect way to revive you after the heavy winter meals. I am forever searching for good dal recipes, thank you! All time my family faviourte!! looks delicious and like the click!! 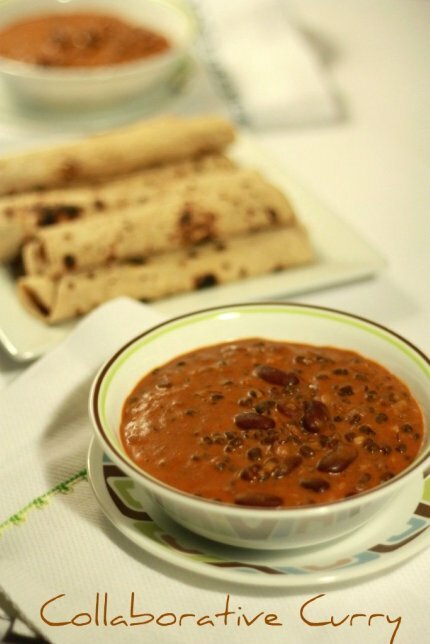 Dal makhani looks simply superb.....lovely clicks as always :). oh I love all those spices - this must be out of this world! Healthy and delicious dal. Lovely Presentation!! Creamy and healthy..Looks tempting and delicious...Ippo kittiya kazhikkarunnu. rich and creamy...i've never ventured in using the who urad though !! Awesome click as always galz!!!! looks so creamy and yummy..
Wow Sunitha...Its like a page from a gourmet magazine..What a spread..comforting and delicious. 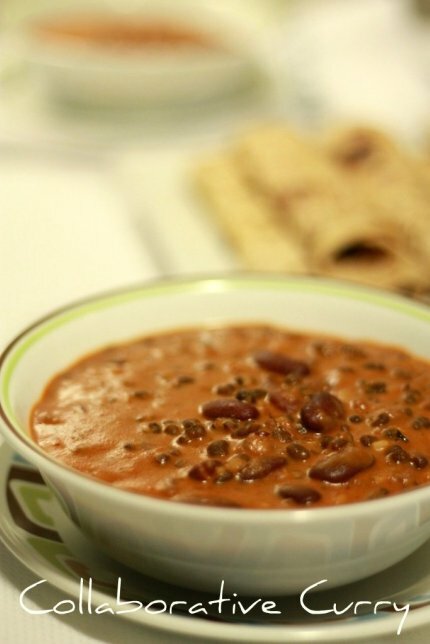 I grew up eating my mom's Dal makhani and your post is making me nostalgic. Absolutely love Dal makhani and what a superb presentation. I do make it here for my kids so that the legacy continues...Yes..Spring is in the air and I myself have been eagerly awaiting for the flowers to bloom and the beautiful chirping of the birds. Nice! Will try it for sure..is it Kasoori methi(the dry methi)? or it is a different thing?